Once again I've missed the deadine for the actual linky at Dear Beautiful, but was determined to get my siblings photo on this blog before July is over. It's been so tricky to get a photo of the three of them together this month as it has been an extraordinarily busy month - with end of Primary school for J, all the usual hospital appointments for Miss T, and generally lots of end of term stuff with drama shows for both J and D and the list could just go on and on. So I've had to search back over the month to find the very few photos that I do have...The photo at the top of the post is just two of them but I really liked it so had to include it. And a day out at the shopping centre. And that was it. Will have to do better in August at getting pics of all three of them. No excuses now the summer holidays are here. Hopes and dreams lay ahead. Feeling so proud of our little boy. Smiles turned to frowns and tears and screams. This so called 'education' - the price you paid. Set in their ways, they didn't understand you. But they stuck to their own hymn sheet, played the same old song. At 5 years old, you weren't to blame. Homeschooling - and my how you shone. Headlines in papers, made the doubters believe. Over three years we unravelled the harm they had done. We held our breath tentatively. Was the choice was right? Finally a school that knew what to do. A rare gem of a school, I wish there were more. No-one could have predicted this happy end. Instead you leave Primary school with a heart full of gladness. And we are eternally grateful to your primary school. When Tanya Byron (yes, the real Professor Tanya Byron, the well-known clinical psychologist you've seen on the TV) was 15 years old, her grandmother was brutally murdered by a heroin addict. That horrific experience led Byron to try to understand why someone could act in that way, and what it was that made them tick. In this book, Byron fills six chapters with powerful stories based on her years of training - six placements, each six months long, each in different challenging environments. Whilst the patients themselves have been fictionalised to protect their identities, Byron is remarkably honest and open about how she felt and acted throughout. The stories are gripping, taut, fascinating. I certainly could not do what she does, nor coped as well as her with the harrowing tales she faced. But despite the struggles and difficulties, and frequent loss of confidence in her own abilities, she continued, she learned and she moved forwards, helping many patients in a kind, caring and compassionate way. One thing this book strikes home is how small the gap is between 'sane' and 'mad'. A wrong choice, a lack of support, a difficult situation and we could be sitting on the opposite side of the psychologist's desk. Not everyone can be cured, not everyone wants to be. But despite working in the field for 25 years, Byron herself says "Nothing has changed. We don't like mental illness - we don't want it in ourselves because it frightens us... We expect people to be mentally ill in ways that we can accept." This is a fascinating and hugely interesting book. The stories aren't always pretty, but the book has been brilliantly written. Highly recommended. 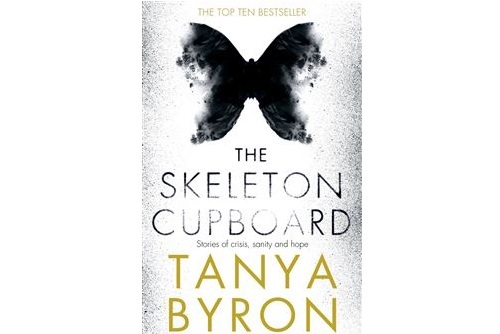 The Skeleton Cupboard, by Tanya Byron is published by Pan Macmillan and is available from their website. After receiving some of the items he chose with his Silver Mushroom voucher, D was keen to put them to good use. I adore this cake cooling rack he chose so he decided to make some chocolate cupcakes so he could use his new cooling rack. He picked a recipe from his 'The Great British Bake Off Great Book of Baking' and got started. I love seeing his independence in the kitchen nowadays. I hardly need to supervise him as his confidence has just grown and grown. Often we find that chocolate cake tends to go dry when we make it but this was deliciously moist. I'm wondering whether it is because this recipe uses oil instead of butter/marg? and also includes a fair bit of milk too? We didn't have sunflower oil as the recipe required so used groundnut oil instead. The cake mixture turns out really runny and I was dubious as to how well it would rise as it only needed one egg. But they turned out brilliantly. Albeit a little messy to scoop into the cake cases. Mixed well using a hand mixer until combined and thickened up. We could resist waiting until the cupcakes had totally cooled so ended up icing them and eating them quickly so the icing wasn't quite a firm as it could have been. Then finally finished with some sprinkles on top. Who says there's no such thing as a free lunch! 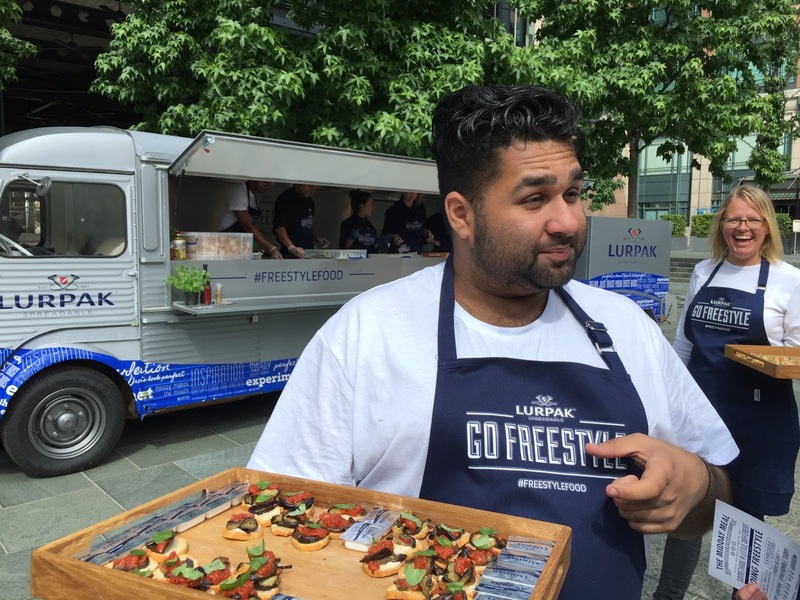 Following on from Lurpak's Freestyle Food promotion last month, this month they are offering a free lunch to help shake up people's existing food routines. 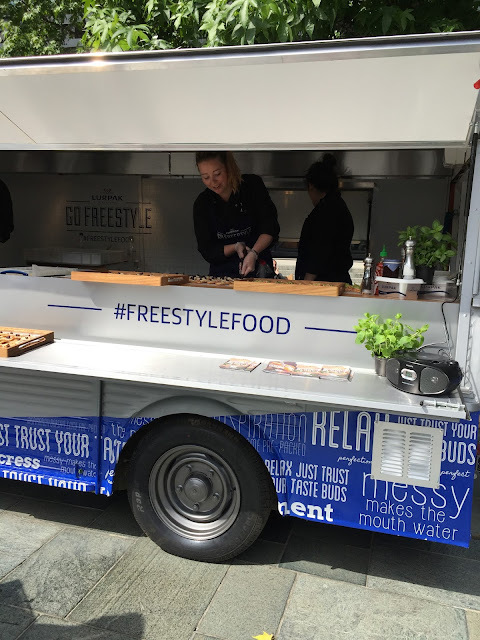 They'll be serving a refreshingly exciting new range of top freestyle sandwiches and crostini style canapés to hungry lunchers absolutely FREE of charge. 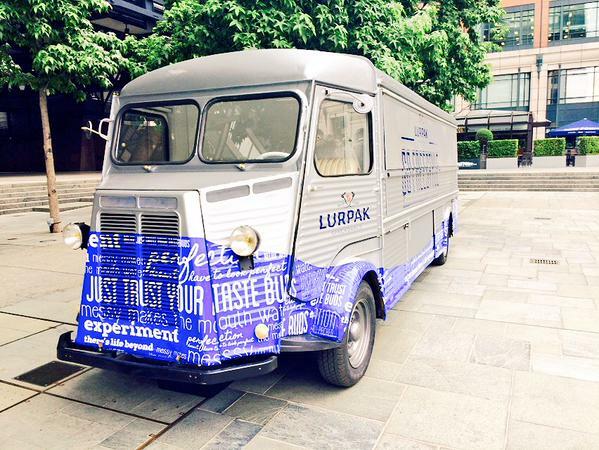 All information regarding Lurpak Foodtruck dates and venues has been provided by Lurpak's representatives and is correct to the best of our knowledge at time of publishing. All images courtesy of Lurpak. A friend gave us this dress for Miss T and although it is plain white and simple, it just looks stunning on her. When she picked some lavender - the contrast of the lilac colour against her white dress looked lovely so I grabbed the camera to snap a few pics. Soon her foot was hurting due to her JIA, so we put a chair outside. But it wasn't long before she was smiling again. My brave and lovely girl! The obvious choice would be my dear husband who puts up with so much and does so much for us all. Despite his fear of needles, he's really stepped up to the mark and has been trained by the nurse to give Miss T her weekly methotrexate injections. But sadly the reality is that we'd never get anyone to look after the kids for a whole weekend for us to be whisked away to Tuscany, so instead I'm going to nominate one of my closest friends, Caroline, who is equally deserving of a surprise treat. And I reckon it would be a real surprise for her because although we have many things in common, the online world is not one of them. Whilst I spend my days blogging and on facebook, twitter and Instagram, she once asked me exactly what a blog was and whether it was the same thing as facebook. So she may not ever even read this! In many ways that element of our friendship reminds me of the set up at Tuscany Now. 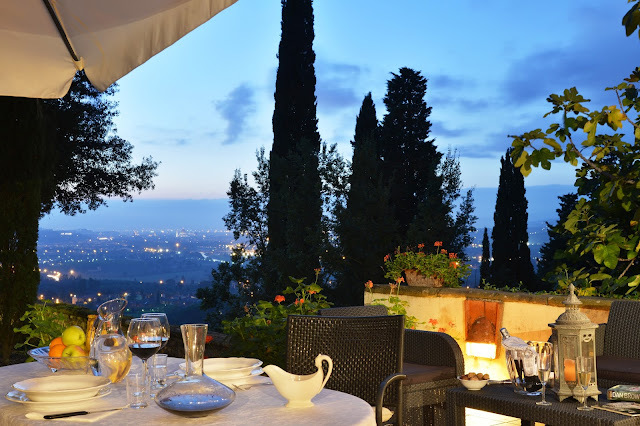 With a brilliant online presence in the form of a fantastic website where you can browse their selection of suberb villas, find out about the region of Tuscany and let them know your specific requirements to get tailored advice. Yet they also have oodles of on the ground knowledge that comes from first hand experience making them true experts - you can speak to them one to one on the phone or even in person at their London based offices. A perfect combination. There are so many reasons I have for nominating Caroline that it would take several blogposts to cover everything, so instead I'm going to focus on a few memorable things that have happened over the past 12 years where Caroline has just shone as the amazing true friend that she is. Firstly she understands. She really understands what life is like for me. We both have boys (who were born just 6 months apart ) who can be very, how can we put this,...'challenging'. Individually each of them is really hard work, but together they really are double trouble. I think anyone else would have given up by now, but our friendship is so important to us that we keep on meeting up despite knowing we will have a challenging day. A case in point is one of the hardest days I have ever had with J. We'd arranged to go on an organised educational fungi hunt with Caroline and her kids. And both boys were being incredibly uncooperative that day. J struggled a lot and her son was extremely vocal about how much he hated fungi shouting it out loud for the entire group to hear followed on by telling them about the fungi he had growing on his foot with his fungal toe infection. Thankfully we both laugh about it now but it was a very hard day at the time. 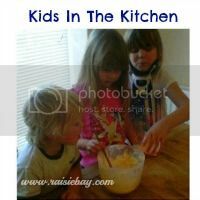 When we were homeschooling J and D, Caroline was one of the few people who realised just how full-on homeschooling can be as I didn't get a break from the kids throughout the week. I remember her meeting us at the park whilst her kids were at school when I was heavily pregnant with Miss T to run around and play with J and D at a time when I was unable to. When postnatal depression struck after Miss T was born, Caroline was one of very few people I could speak to because I knew she had been there and she understood. I would text her when I was having a difficult day and she would have the most wonderful words of wisdom for me that would get me through the day. I have a lot to thank her for. But most of all she deserves this because she's a mum. A busy, frazzled mum, like me. Who rarely gets anytime for herself and when she does, she uses that time to help others. A mum who runs around after her kids non-stop without complaining. A mum who at times just wants to scream and tear her hair out but just smiles, keeps calm and carries on. So this is where the dream begins. Tuscany has long been on my bucket list of top places to visit. In fact, I've had this Tuscany inspired pinterest board sat on my pinterest account for at least a year or more I reckon. Follow Rebecca's board Tuscany inspiration on Pinterest. We'd spend a couple of days away from it all (and more importantly away from the kids!) 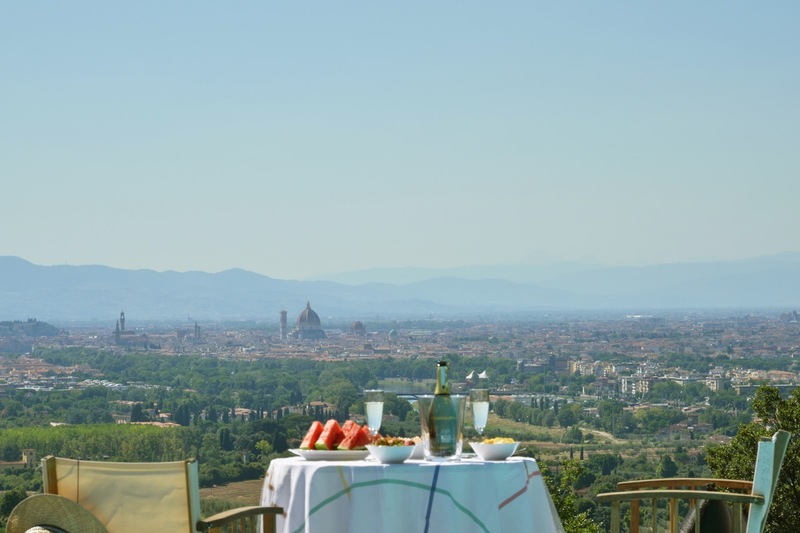 enjoying the views of the Tuscan countryside, and seeing the must-see places that this beautiful region of Italy boasts. Of course the leaning tower of Pisa is a must. And whilst there is absolutely tons to do in Tuscany from visiting the iconic Duomo to the Basilica di Santa Croce, I have a feeling that there is magic to be spotted everywhere you look around you whether it be picturesque views of rustic Italian farmhouses in luscious green fields or the peachy terracotta streets and alleys with vintage bicycles leaning against walls. I imagine that it really is one of those places where the reality matches, exceeds even, the picture postcard perfection that I visualise in my mind when I think of Tuscany. We'd return from wandering the pretty streets of Florence, seeing a few of the must-see sights, tasting the authenticity of pasta the way it should be done, and we'll feel refreshed and relaxed and ready to face whatever the kids may throw at us. Now there's one thing missing from this blogpost. We've been good friends for 12 years. We meet up regularly. But rarely get a chance to stop and sit still. So in all those 12 years, it turns out that we are always kept so busy running around after our kids whenever we meet up, that we have NEVER had the opportunity to get a photo of us. So if we did get to Tuscany, I promise there would be a blogpost to follow packed with selfies of us with all the sights of Tuscany as our backdrop. So with the absence of a photo of me and my friend, thankfully Tuscany Now came to the rescue by providing a couple of stunning photos to use in this blogpost so I'll end with those to get you dreaming about Tuscany as much as I do. image courtesy of Tuscany Now. Stunning views! Image courtesy of Tuscany Now. This is my entry into the Tuscany Now 'Nominate to Appreciate' competition to #TuscanyNominate. You can see more details here. 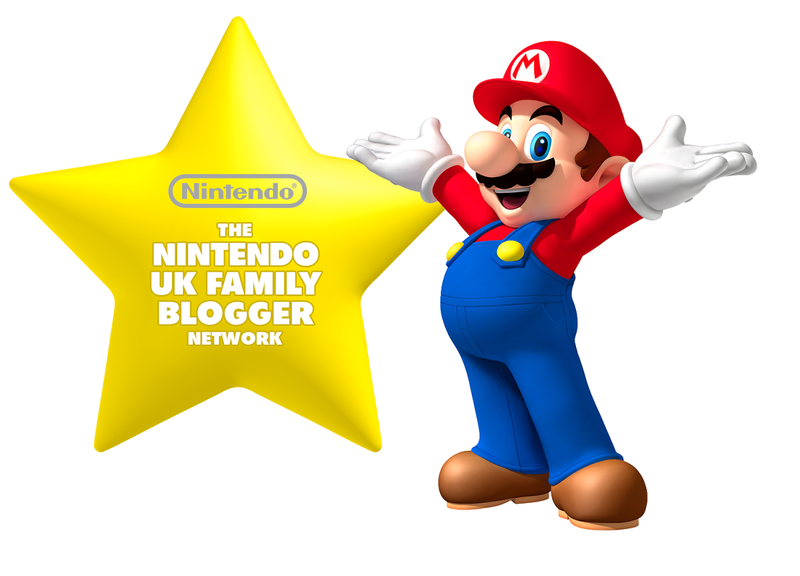 The boys loved the fabulous Yoshi craft pack that Nintendo sent us recently... but they are completely over the moon with the new Yoshi's Woolly World game on Wii U! This is the latest in the Yoshi series, and just as in Yoshi's New Island you play the lovable character as he takes on a new adventure. In this game, everything has been turned to wool - even Yoshi himself - and the evil Kamek has turned some of the Yoshis to yarn balls by unravelling them, and stolen them - hiding them around the various worlds. Miss T loved the woolly Amiibo, but it was eventually rescued to join the game. In Yoshi's Woolly World you have to complete levels and rescue the other Yoshis. You have to stop Kamek and defeat the bad guys. You have yarn balls instead of eggs, and everything is made of wool. There are gems instead of coins, and you can also use power badges such as: clear the course, make all the yarn balls big, powered-up ground pound and many more. Poochy is also in the game and he can help you get to secret areas. You can switch between mellow mode and classic mode. In mellow mode you have wings, whereas in classic mode you don't. You can use yarn Yoshi Amiibos or if you use a different Amiibo your Yoshi becomes a Yoshi version of that character. If you get all the pieces of a yarn Yoshi in a level then you can re-make him and can choose to play as that Yoshi. You can also play in two player mode. My favourite Yoshi's are: Burt the Yoshi and Moo-moo Yoshi. I think this game is awesome! So there you have it - J, the head gamer in the family, says it is awesome. You can find out more about the game and see a trailer for it here and you can read about our Yoshi craft adventures here. Thanks Nintendo for sending us a download code for Yoshi's Woolly World! We eagerly watched the first two programmes of this year's child genius series with excitement. You see J got through to the very final audition stage. He was picked out as being one of the brightest kids in the UK. After a series of tests and interviews, including several hours of filming in our home, he made the top 30. We went up to London for a further day of tests and interviews and it was after that we found out he hadn't made it to the top 20 who end up on the televised programme. Despite it being J's idea to keep progressing as far as he could through the selection process (we had begged him not to once we had watched last years programmes on 4OD), he wasn't too disappointed when we broke the news to him that he hadn't quite made it onto the programme. It meant we could go away on holiday to Paris in February half-term and then again on holiday glamping in May. So that more than made up for any disappointment. The way things have progressed with Trinity's diagnosis of JIA and hospital visits has meant that we would have been unlikely to have been able to continue with the filming schedule anyway. Back in January on that Child Genius assessment day with her leg in plaster, we still believed it to be a short term injury. So things did work out for the best in practical terms. But now having seen the programmes aired, it's so much more than that. I'm feeling so grateful that we had a lucky escape. I was in tears watching Kale return to his seat after scoring zero in one of the rounds. He pounded a fist on his heart and mouthed 'it hurts on the inside', repeating that statement twice. We'd seen this programme criticised in the media. But our experience was that the crew made J's experience a positive one throughout the selection process, so I felt the criticism wasn't justified. But seeing this wonderful lad, Kale, with so much going for him, feeling like that just broke my heart. No kid should be made to feel like that. Some people put the blame firmly on the parents, saying they are too pushy and put too much pressure on these kids. But I'm well aware of how much editing goes on and how the production crew need to have a 'story to tell' so I suspect it's highly edited footage that we are seeing in the final cut. Even our favourite, Thomas, who seems to be a firm favourite for the title, is receiving bad press. With the 2nd July issue of Waitrose Weekend stating that 'Thomas, 12, is obsessed with financial markets, so will probably bankrupt the country one day'. We love Waitrose and with the cookery courses we have done with them and D has done and how supportive they've been towards our children, I was actually quite stunned to read this. I know it's intended as a bit of a joke but imagine how Thomas and his family would feel reading that. These are real children and real families with emotions and feelings. It was Thomas and his family who sat next to us on that audition day back in January and they were one of the loveliest families we've ever come across. Thomas was such a kind caring lad that oozed happiness and enthusiasm. He smiled all day despite his heartbreaking background story of losing his dad at such a young age. He is incredible. We heard first hand from him that his primary motivation for applying for the show was to show that not all parents are pushy and that kids can be exceptional whilst having kind, caring, supportive parents who are proud of them no matter what. We were really proud of how well J did and how far through the process he got. But the reason we were so proud of him was not because of his intelligence or academic ability but because he was overcoming some of the difficulties he faces with his aspergers by putting himself forward. We know he was very much out of his comfort zone in all of the interviews he undertook, yet he gave it his best shot. The tests were a different matter as he adores tests and we suspect he did really well on the academic side of things and it was just his final interview where he probably came across as a pretty well rounded kid which meant he didn't get through. He wasn't boastful. He didn't show off. We weren't the 'pushy parents' that the programme likes to portray. So he didn't make the final cut and boy was that a lucky escape! I'm very proud of my little boy today. We saw this amazing blogpost about him on Silver Mushroom here after he entered their #FathersDayBakes competition. He's had great fun choosing his new kitchen items from Silver Mushroom's fantastic range. We've just put the order in, so he will be mega-excited when it arrives. You see most 9 year olds love to receive toys and games but D loves to browse kitchen utensils, bakeware and other kitchen items. So this is just perfect for him. Minion madness seems to have taken over the world and it hasn't bypassed the Beesley household. We've been reviewing some great Minion themed stuff to coincide with the recent launch of the Minions Movie. Everyone seems to love minions. And what's not to love? They're pretty cute characters really aren't they? We've also long enjoyed playing Top Trumps in various guises depending on the latest theme the kids are into. Top Trumps is a simple concept of a game, but can bring hours of enjoyment with a single pack of Top Trumps cards. Great for travelling or to play at home. So putting together the Minions theme with Top Trumps cards is just a genius idea. Through these cards, the minions are travelling through various eras in history from Dinosaurs to Ancient Egypt. The game is played by competing on cleverness, bravery, leadership, mischeivous and a top trumps rating. There are 30 cards in total and each features a different movie themed mission. The cards are aimed at children aged 3+ and Miss T joined in the fun too as it is such a great concept that I think anyone aged between 3 and 103 would enjoy it. The RRP is £4.99 and they are out now available for purchase. This one contained the new Crayola Colour Alive Minion themed colouring book. This is a really unique concept that I hadn't seen before where you can download a Colour Alive App to go alongside your colouring book that 'brings your colouring to life'. You can find out more including a video and instructions that we found really helpful here. D coloured in a page of the colouring book. There are 16 pages in total. Once the page is coloured in with the markers that come with the colouring book, you use the app, line it up with your picture to get started, then the picture comes to life with special effects too. You can move the character around and see it with your own background. You can also even take photos and selfies alongside your coloured in character. Really cool stuff that my kids really loved! It took a while for me to get to grips with the app so it really is worth taking a quick look at the guide on the Crayola website to really make the most of it and understand what it can do. 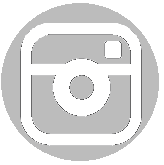 You can find the Minions Colour Alive Colouring book at leading retailers. The RRP is £6.99 and it would make a great gift for any minion fan. Look out for other Crayola minion themed items coming soon too. disclosure: We were sent the Top Trumps card and Crayola Minions Colouring book for the purposes of review. All opinions are our own. We LOVE, LOVE, LOVE Emily Gravett. Her books are just so clever. We've read so many of them and adore the illustrations and clever story plots which are perfect picture book stories. But there's something more you find with many of Emily Gravett's books - The book becomes part of the story. We saw this with Again! where the little dragon has burnt a hole through the book's page with his fiery breath. In Little Mouse's Big book of Beasts the pages are made to look like Little Mouse has ripped and torn them and in Meerkat Mail the pages are made to look like postcards. When I was a kid, I remember wanting that something more from books. I used to make my own little books out of pieces of paper folded together and had little keys made of cardboard hanging on string on certain pages of the book, then a key hole cut out on another page for the key. I remember making little envelopes stuck in with letters and 'treasure maps' that unfolded to be used as part of the story as you 'travelled' through the book. And I think this is why I absolutely adore the Emily Gravett books which have that extra added element where the pages of the book become a part of the story that you interact with. Wolves is a perfect example of this. With one of those little cardboard pockets that used to be found in all library books in the old days complete with a little white tea stained card that can actually be removed from that little pocket, this is just the sort of thing we love about Emily Gravett. 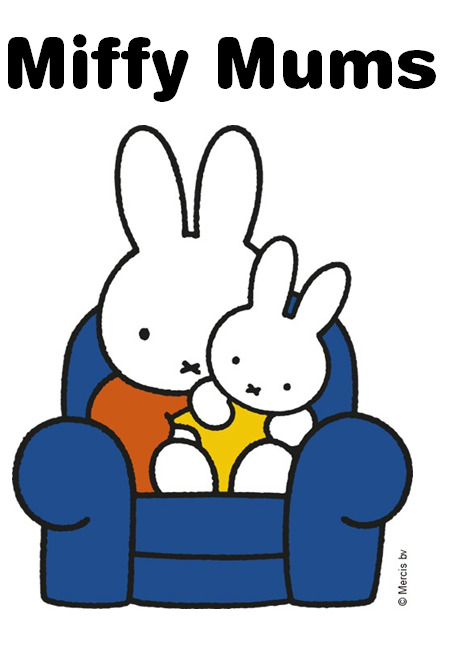 Miss T said "I like rabbits card" as she took the little white card out of the pocket and then put it back in again. The opposite page has one of those sheets of paper that gets date stamped with the return date printed on it. And at the end of the book a page with letters with one of the envelopes actually opening up containing a letter that can be removed and read, enhancing the story. Utterly brilliant. These sort of things show what an absolute genuis Emily Gravett is. The story itself is simple yet fantastic. Let's just say when rabbit borrows a book from the library, he gets rather more than he bargained for. Amazingly, Wolves is 10 years old this year and won the Kate Greenaway Medal in 2005. This new 10th anniversary edition is being released this year to celebrate. It contains an extra special element - a cut out and keep book called '10 Little Rabbits' which we are told is wolf's favourite book. I personally could never bring myself to cut anything out of an Emily Gravett book - I will forever treasure it just as it is but I can see just how some children would absolutely love this little 'cut out and keep' extra treat. I very much doubt that I need to specifically state this as I'm sure it's clear from the rest of our post - we absolutely ADORED this book. Miss T loved the suspense build up and really really enjoyed those little extra elements that I've described that take the book from being great to being superb. Thank you so much Panmacmillan for sending us such a special book to treasure and keep! And if you'd like one of your own, it is due for release on 30th July 2015. Wolves can be pre-ordered from Panmacmillan here. Book Review: Bear and Hare Snow! A few of our favourite Emily Gravett Books - featuring Again! and Little Mouse's Big Book of Beasts. School runs, 'sweenies' and secondary school!